Teaching leaders claim lives are being put at risk after it was revealed more than 90% of Lancashire schools contain asbestos. 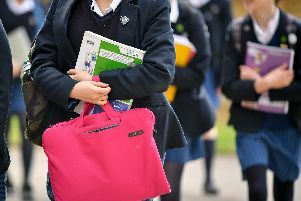 Figures obtained after a Freedom of Information request reveal as many as 41 schools in the Burnley and Padiham area could be classed as being “at risk”, as well as a further 38 in Pendle and 22 in the Ribble Valley. The main teaching unions are now calling for urgent action. Asbestos was widely used as a building material in the 1960s and 70s and banned in the UK in 1999 once the health risks became apparent. A spokesman for the Health and Safety Executive said asbestos could be managed safely if left undisturbed, but the latest findings have led to renewed calls to make schools safer. At least 570 of the county’s 617 schools contain asbestos, according to data released following a Freedom of Information request. There are 41 in Burnley, 38 in Pendle, 50 in Chorley, 40 in South Ribble, 52 in West Lancs and 22 in the Ribble Valley. The county abides by national policy which means leaving asbestos in situ unless it becomes a problem. Between September 2010 and February 2011 the county council paid out £421,322 in compensation and £63,500 in legal costs. Latest available figures, up to November 2013, show that five other claims are still outgoing.